Chapter XV of The Life Divine is a further elaboration of the comprehending and apprehending principles of the Supermind initiated in the previous chapter (vide supra, Chapter XIV Part 3). The comprehending principle of the Supermind is that poise which subserves the knowledge of the Absolute as a unity that holds in its bosom the seeds of all that have the potentiality to be manifested. The apprehending principle of the Supermind is that poise which supports the knowledge of the multiplicity without losing the essence of the underlying unity. Both the comprehending and apprehending principles are equally important operative principles of the Supermind. Because the One is potentially many, the ‘unity’ should permit the ‘diversity’ and the ‘diversity’ should in turn reflect the ‘unity’. 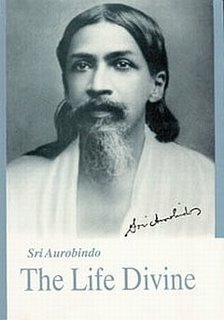 This can only be possible if the Supermind as a creative principle bears the unique characteristic of an ‘ORDERING SELF KNOWLEDGE’ (The Life Divine, pg 143). The Supermind not only ‘creates’ but each creative fiat holds an inbuilt, automatic program so that whatever is destined to be created is invested with a predestined force of execution that not only manifests the creative vision in a world of objectivity but spontaneously aligns it in perfect harmony with other elements in the manifestation. If we consider that the ONE has the potential of manifesting an INFINITE multiplicity, then it would be rather impractical to conceive that harmony can be established in the manifestation. An infinite potentiality can lead to ‘a play of uncontrolled unbounded chance’, ‘a shifting chaos’ (Ibid, pg 143). The very concept of infinite potentiality denotes a sort of continual extension like a recurring decimal. To establish harmony in the manifestation would sound like a chimera. (b)	There must be a field or matrix for the working out of the law. (d)	A field or matrix for the law to operate, which is provided by successions in Time and divisibility in space.